Search Engine Optimization (SEO) is the art of getting a web site to rank high in search results. Because so many people rely on the top search engines (especially Google and Yahoo) to find what they're looking for, ranking near the top of the search results for keywords that are relevant to the focus of your site can have a tremendous impact on the number of visitors your site receives. There are two types of SEO techniques, on-site and off-site. On-site techniques involve making changes to your own web site. These include filling your site with quality content that mixes in the right balance of keywords, and choosing the right page titles, meta tags, and internal link structures. Off-site SEO is about link popularity - search engines judge how useful a site is largely by how many other sites link to it, and by the quality of these incoming links. LinkMachine is about helping you exchange links with other high quality sites that are relevant to the topic of your site. This is a very effective method of building a site's link popularity. This section focuses on some of LinkMachine's advanced features that are especially focused on helping you to increase your site's search engine ranking. 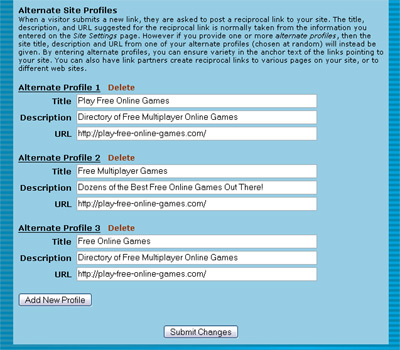 By default, each site's entry in LinkMachine's Site List begins with the site's title (clicking on the title launches the site in a new window), followed (if the site has a reciprocal link to your site) by a chain link icon that when clicked will launch the reciprocal link's page in a new window. It's possible to display additional useful information here as well. Click on Change Settings >> SEO Settings. To change what information is shown in each entry in the Site List, select an option from the Site List Display drop down menu. You may choose to show each site's title, its URL, or its title, URL, and rank. Examples of these three variations are shown below. The Site List Display options. Displaying each site's rank in the Site List can be useful for helping you decide which link submissions to accept and which to reject. A reciprocal link on a sites with a higher Google PageRank will do more to increase you own site's PageRank than a site with a lower PageRank. The Alexa Rank is Alexa's estimate of where the site ranks in its list of web site popularity. The lower this number, the more visitors the site receives - and so the more visitors that a link from the site is liable to send to you. By turning on the option Show the Google PageRank of Each Site on the SEO Settings page, you can have LinkMachine keep track of the Google PageRank of the home page and the reciprocal link page of each site that you exchange links with. If this option is turned on and your Site List Display (above) is set to Title, URL, and Rank, then each site's PageRank will be displayed in your Site List. If the site has a reciprocal link to your site, then the PageRank of the site's reciprocal link page will be shown after the PageRank of the site's main page, separated by a slash. The PageRank of the site's main page and its reciprocal link page are also shown on the site's Modify page. Having instant access to each site's PageRank can be useful in helping you decide whether to exchange links with a site. Note, however, that in order to find out each site's PageRank, LinkMachine must send automated queries to Google, which is against their terms of service. Because of this, this option is turned off by default. Google has been known to sometimes penalize a web site that uses "black hat" SEO practices - "cheats" such as setting up "doorway" domains that have no purpose other than to link to the main site, in hopes of increasing its PageRank. When Google penalizes a site, the site's PageRank is reduced to zero and that site no longer shows up in Google's search results. Some people believe that a site's PageRank can be hurt if that site links to a site that's been penalized in this way. If this is the case, then it is important to check the sites that you exchange links with, to make sure that none of them have been penalized. If you've turned on the Show the Google PageRank of Each Site setting, then there will be a new option added to your Site List's Show drop-down menu. Select to show Sites with PageRank 0 to display only those sites in your list with PageRank 0. However, keep in mind that it's not only penalized sites that will have a PageRank of 0. More commonly, brand new sites that have gone online since Google's last PageRank update will also have a PageRank of 0. If you want to exchange links with high quality new sites but avoid exchanging links with sites that Google has penalized, you can get a rough estimate of a site's age by checking its listing in the Internet Archive. You can find a link to a site's Internet Archive page at the bottom of the site's Modify page (see below). When you use LinkMachine to exchange InstantLinks with other sites that use LinkMachine, the reciprocal link created on the other site (the link that points to your site) will automatically use your Site Title for its anchor text, your Site Description for its description and your Site URL as the address that the link points to. These three pieces of information, which we'll call your site's "primary profile", are entered on the Site Settings page. When a visitor submits a link using your site's link exchange submission form, they are encouraged to post a reciprocal link on their site, pointing to your site. Again, the information that they're given for the reciprocal link comes from your site's primary profile. Finally, your site's primary profile information is used to replace the %MYTITLE%, %MYDESCRIPTION%, and %MYURL% wildcards in the link exchange invitation e-mails that you send out. The benefit of this is that you have control over the anchor text, description, and URL used in the reciprocal links to your site. The tradeoff is that all of the reciprocal links to your site may end up using the same anchor text, description, and URL as one another. However with LinkMachine, you no longer have that limitation. On the SEO Settings page you can enter any number of alternate profiles - alternate sets of title, description, and URL for your site. If you enter one or more alternate profiles, then when an InstantLink is created between your site and another, the information for that site's reciprocal link to your site will come from one of your alternate profiles - LinkMachine chooses randomly. Your primary profile will not be used. Likewise when a visitor submits a new link, the information they're given as a suggestion for their reciprocal link will come from one of your alternate profiles, and when you send out a link exchange invitation e-mail, the information about your site will be filled in using a randomly chosen alternate profile. By creating alternate profiles, you can ensure that there will be variety among the reciprocal links to your site - while still having control over them. Why would you want any variety among the reciprocal links to your site? For one thing, the anchor text of the links to your site (the actual clickable link text, which comes from your Site Title) goes a long way toward determining what searches your site will rank well for. If a lot of links to your site have the anchor text "fishing tackle", for example, this will generally help improve its rank in search results when people type "fishing tackle" into a search engine. You can create alternate profiles with different titles, to help your site rank well for a few different related keywords. For instance, you could have some links to your site use the keywords "fishing tackle", while others use "fishing equipment" and others use "fishing gear". Several Alternate Profiles with varying titles. In addition, some people believe that the percentage of the links pointing to your site that include a particular keyword will determine how well you rank in searches for that keyword. While you might rank better for a keyword in some search engines if all of the links to your site contain that keyword, in other engines you might rank best if just 40% of the links use that keyword. By using alternate profiles, you can determine roughly what percentage of reciprocal links to your site will use a given keyword. If you want keyword A to appear in twice as many links to your site as keyword B, create two alternate profiles with keyword A in the title, and one with keyword B. Another use of alternate profiles is to make it so that the reciprocal links to your site point to a variety of different pages. Usually you'll probably want reciprocal links to point to your site's main page. But in some cases, you may want to get links to point to particular other pages on your site as well. You can do this easily using alternate profiles, by setting the URLs of several alternate profiles to point to several different pages. In fact you can even enter the URL of an altogether different site of yours into an alternate profile, allowing you to set up "non-reciprocal" or "triangular" link exchanges: "I'll link to you from my site A, if you place a link on your site to my site B". In addition, on the Link Categories settings page you can select for any (or every) category a single alternate profile that will be used for all links that are assigned to that category. This way you could, for example, have all of the "jewelry" related sites in your link directory link back to a jewelry related page on your site, using jewelry related anchor text. When LinkMachine checks each site for its reciprocal link back to your site, it will consider a reciprocal link valid if it points to the URL in your primary profile, or any of your alternate profiles. When you have LinkMachine check each site for its reciprocal link, it records the anchor text of each reciprocal link pointing to your site. To view the anchor text of a site's reciprocal link, go to that site's Modify page (Click the Modify link on the site's entry in the Site List). You will see the reciprocal link's anchor text under the label Reciprocal Link URL. A reciprocal link's anchor text, on a site's Modify page. You can also have LinkMachine show you just which sites use irregular anchor text in their reciprocal link. In the Control Panel, select Sites with Irregular Anchor Text from the Show menu. A reciprocal link is considered to have irregular anchor text if the anchor text differs from the Site Title that you specified in your site's primary profile (on the Site Settings page) and the titles you specified in any of your alternate profiles (on the SEO Settings page). Normally when you move your mouse over a link, the URL that the link points to will appear in your browser's status bar. This is usually the case for all of the links on the link pages that LinkMachine generates. In a few cases, however, you may wish to hide the actual URL that a link points to, from the average visitor to your link pages. Why? Say your link pages include affiliate links. For whatever reason, some people seem to want to avoid following affiliate links, as if by giving due credit to an affiliate they would somehow be put at a disadvantage. This mistaken perception causes some people to avoid clicking on affiliate links, or to place the mouse over an affiliate link, read its URL in the status bar, and then type the URL into the address bar, leaving out the affiliate information. You can hide the URL that a link points to by specifying alternate text for that link. To do this, go to the site's Modify page by clicking on the site's Modify link in its Site List entry. Then, under Alternate Link Text, enter the text that you'd like to have appear in a visitor's status bar when they move the mouse over this link. You may enter a version of the site's URL that leaves off the affiliate information, or the site's title, or anything else you wish. This feature works differently depending on the browser that is being used to view the link in question. As of this writing, moving the mouse over a link with alternate link text will display the alternate text in the status bar on Internet Explorer, and leave the status bar blank in FireFox. At the bottom of a site's Modify page is a list of useful links that will display various information about the site. These include the site's Alexa information page, its Internet Archive history page, and its list of backlinks (links pointing to that site from other sites) according to Google or the MSN search engine. The set of information links on a site's Modify page. LinkMachine allows you to create highly customized link pages that match the look of the rest of your site. This is done using page templates. Normally you would create a page template, then upload it and select it for use, on the Link Page Format settings page. In addition, you can choose to create a different page template for each category of links, if you'd like. To do this, create and upload each category's page template as usual. Then go to the Link Categories settings page, select a category that you've created a special page template for, and select that category's page template from the drop-down menu under Category Link Page Template at the bottom of the page. Then click Update Template. Repeat this process for each category for which you've created a special page template. Any categories that you don't specify a page template for will use the Category Link Page Template specified on the Link Page Format settings page, as usual. Why would you want to create special page templates for some (or all) of your link categories? As an example, you could include an article about dating services in the page template for your dating services link category. This relevant content accompanying your links would make the page more useful to visitors, and more appealing to search engines. In this way, you could create a "niche" site featuring pages of categorized affiliate links accompanied by informative articles relevant to the topic of those links. 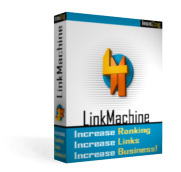 LinkMachine uses the Google search engine to find potential link partners. Making automated queries of the Google engine in this manner is not in compliance with Google's terms of service. To comply with the terms of service, you may register for a free Google Web API Key at Google's site. Once you've received your key, enter it on the Site Settings page, under Google Web API Key, and press Submit Changes. Now that you are using a Web API key, your searches for potential link partners will be in compliance with Google's terms of service. Note that having LinkMachine display each link partner's Google PageRank (by turning on Google Web API Key on the SEO Settings page) also involves making automated queries of the Google search engine. Using a Google Web API key will not make a difference in this case, because Google does not make PageRank information available via their Web API.